Reassure your customers and increase your conversion rate and sales on your PrestaShop website by joining the new customer feedback service by Google. 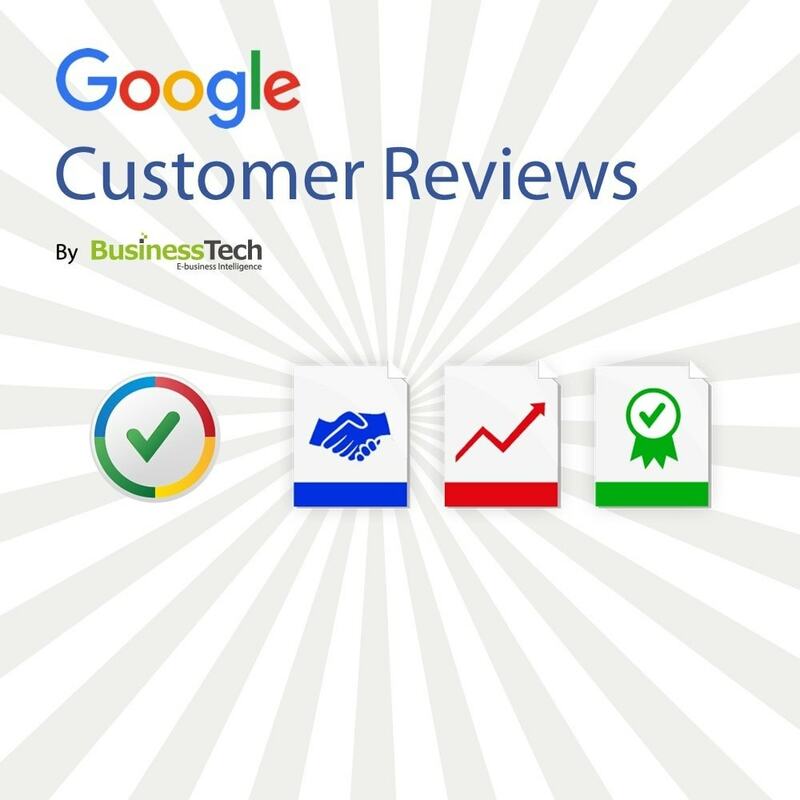 Show a badge on your website with the Google Customer Reviews logo and the rating resulted from reviews. By using this module in conjunction with our "Google Merchant Center (Google Shopping)" module (available separately on https://addons.prestashop.com/en/price-comparison/1768-google-merchant-center-google-shopping.html), you will get the best possible results on the PrestaShop e-commerce platform. Warning : to use this service you must have an active Google Merchant Center (Google Shopping) online account. Customers who’ve made a purchase on your site are presented with an option to opt-in to receive an email requesting feedback from Google about their experience with your store. If the customer opts-in, they may receive an email after their order has arrived. The collected ratings are then displayed on your optional Google Customer Reviews badge, appear in your Merchant Center dashboard, and are used for seller ratings. Important note : you will be able to manage this new service directly in your Google Merchant Center (Google Shopping) online account. 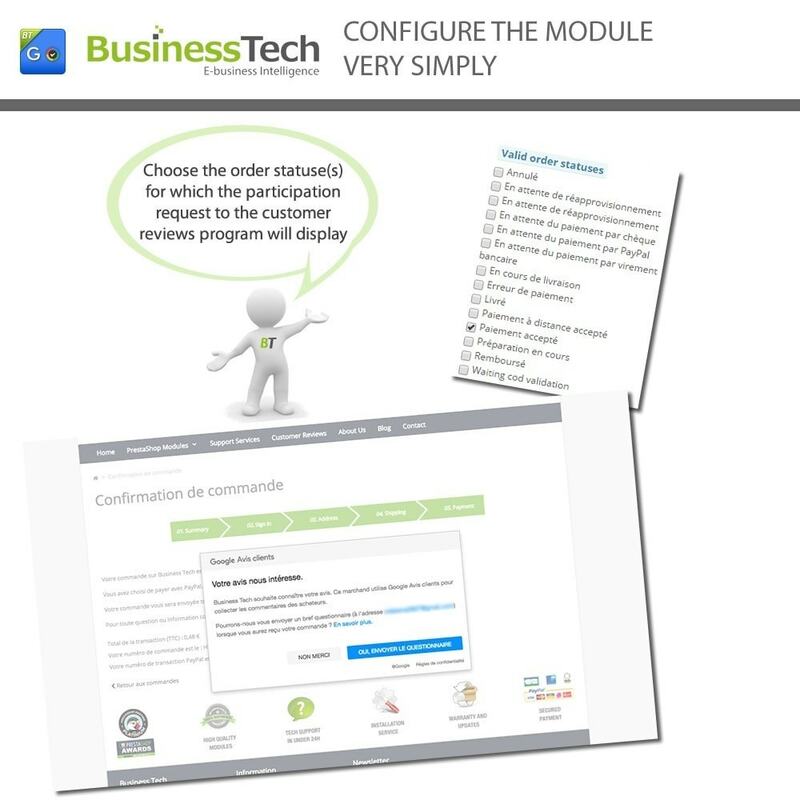 As always, BusinessTech has tried to make the module configuration as easy as possible for you, while insuring the highest possible robustness and flexibility. To use this service you must have an active Google Merchant Center (Google Shopping) online account. 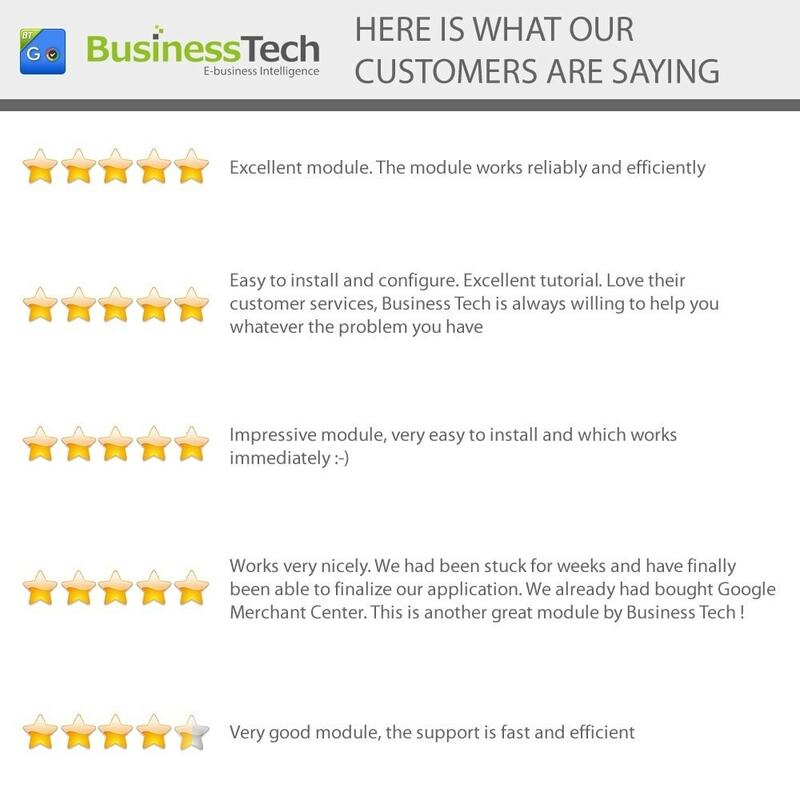 Of course, this module integrates perfectly with our "Google Merchant Center (Google Shopping)" module (available separately on https://addons.prestashop.com/en/price-comparison/1768-google-merchant-center-google-shopping.html). Your customers will appreciate being able to give their feedback on your shop. If you activate the badge display, they will like to browse the other customers reviews, and will be satisfied with your transparency. This will increase their trust and their perception of your shop. The display of reviews about merchant in Google Shopping and on your Google AdWords advertisements will also reassure your customers and encourage them to go to your site. By installing this module you allow Google to display a message to your customers offering them to participate in the“Google Customer Reviews” program. 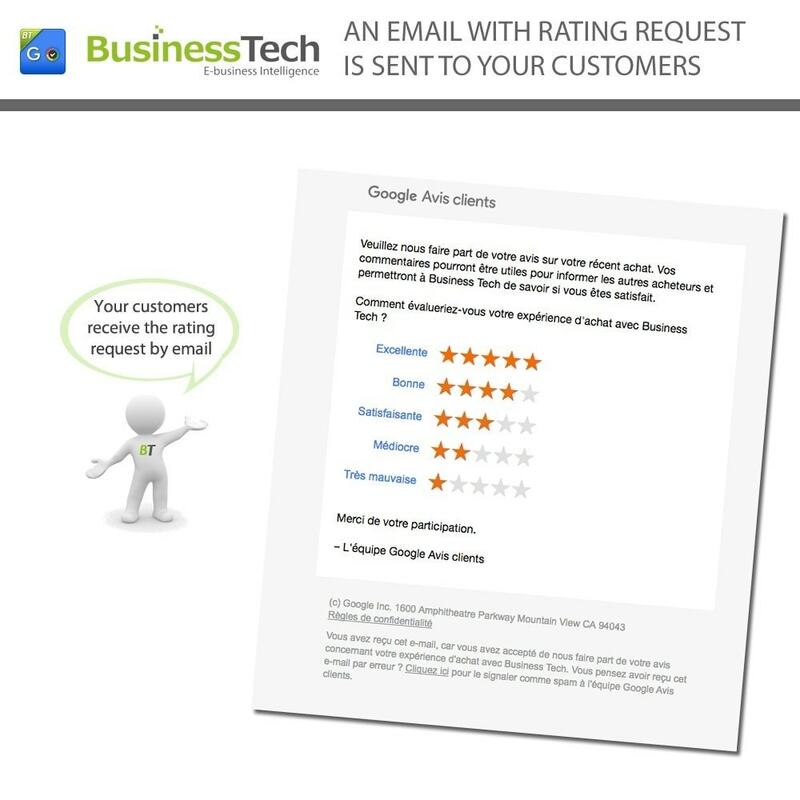 If your customers accept, they will receive an e-mail from Google allowing them to provide feedback on your service. This involves that Google retrieves some of their information, such as, for example, their e-mail address and country of delivery. We remind you that, as responsible for the use of personal data of your customers and visitors and in order to respect the new European General Data Protection Regulation, you must clearly inform your users of this, in an easily accessible documentation(e.g. your Terms and Conditions). You must provide them with the link that will direct them to Google’s personal data policy(https://policies.google.com/privacy/update). You also must inform them of their rights, in particular their right of opposition to the use of their personal data and the means to assert their rights. WARNING: Google requires you to have an SSL certificate (https: //) installed all along the order funnel.